We are facing a myopia epidemic, so it is vital to regularly test your child’s vision! We are facing a myopia epidemic, so it is vital to regularly check your child’s vision! "Nearly Half of the Global Population May Be Myopic by 2050*"
Myopia is anticipated to become a leading cause of permanent blindness worldwide. The myopic progression is of great concern for the World Health Organisation, eye care and general health care professionals, as well as parents. Mounting scientific research indicates that myopia leads to an increased risk of several eye pathologies that may lead to visual impairment or blindness. Researchers and clinicians worldwide are directing their efforts into better understanding the cause and finding the most effective methods to slow down the myopic progression. The myopic progression is of great concern for the World Health Organisation (WHO), eye care and general health care professionals, as well as parents. Mounting scientific research indicates that myopia leads to an increased risk of several eye pathologies that may lead to visual impairment or blindness. Researchers and clinicians worldwide are directing their efforts into better understanding the cause and finding the most effective methods to slow down the myopic progression. Child myopia is reaching epidemic proportions. 60 years ago, 10-20% of the Chinese population was short-sighted. Today, up to 90% of teenagers and young adults are. In Seoul, 96.5% of 19-year-old men are short-sighted. In USA and Europe, approx. half of young adults are myopic, double the prevalence of half a century ago. 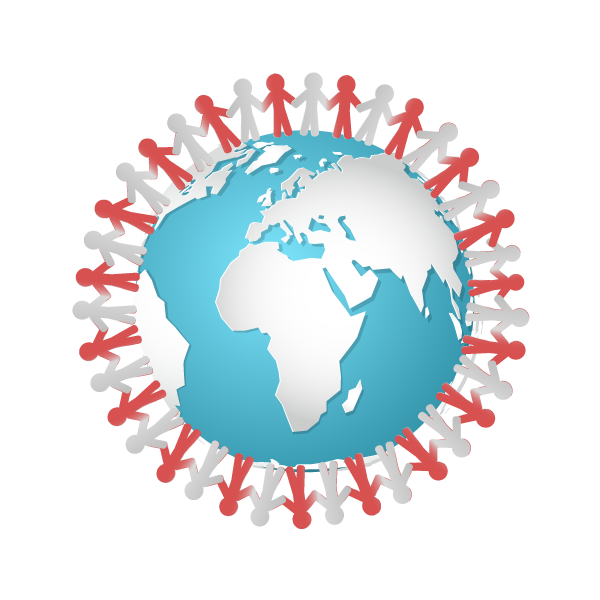 Worldwide, it is estimated that 2.5 billion people (roughly 1/3 of the world population) are myopic. Although there is no cure yet, a number of methods have proven successful at slowing or stopping the rate of progression. 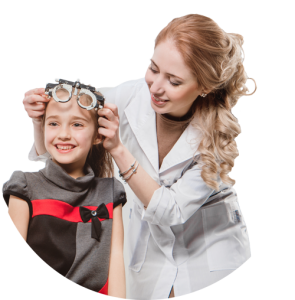 It is important that children have regular eye examinations, which can identify early signs of visual or ocular irregularities. Early, customised intervention plans can reduce progression and the associated risks from myopia. Eye tests are even more critical if one or both parents are short-sighted. Can the progression of myopia be slowed down? Clinicians have proven that, using a personalised eye care plan the progression can be significantly slowed down or even stopped. 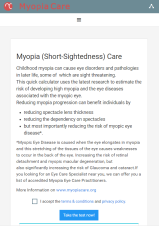 ‘myopia.care™’ is a screening tool designed to support the early detection and correction of myopia reducing the risk of progression and associated eye pathologies. 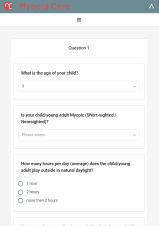 It calculates a probability of your child developing myopia considering factors clinically proven to be associated with it. 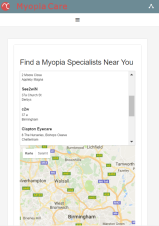 ‘myopia.care™’ is an innovative platform which makes it easier to predict myopia and connect you with an expert. 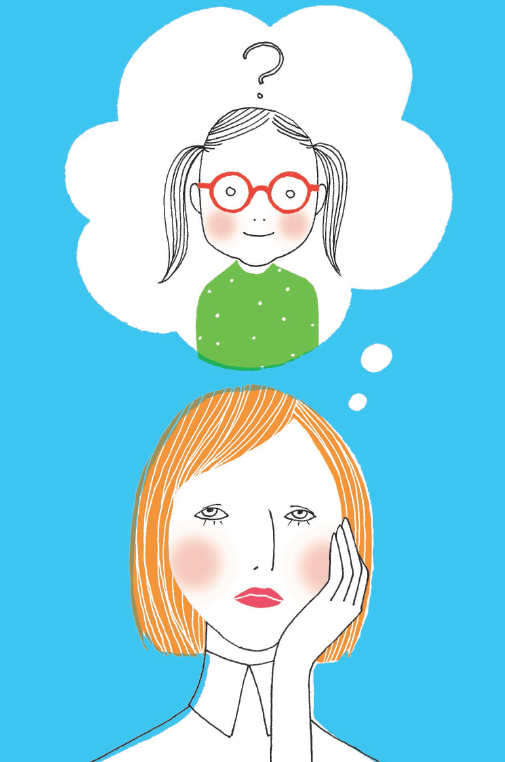 Our goal is to support parents in slowing and stopping the development of short-sightedness in their children. Using a simple questionnaire, it can estimate the level of risk and, if needed, provide you with contact details of a local expert who can help. This allows early intervention, increasing the probability of a successful outcome. ‘myopia.care™’ is a living application, updated regularly on the basis of the latest research. On completion of the questionnaire, a code will be sent to you. Please take this to your chosen eye care practitioner, listed on our website. It enables him to call up the results to use as a basis for commencing a more specialised examination. The results are anonymous. The child can only be identified by the code, and not by name. We strongly recommend finding a professional who is actively engaged in myopia control, and is up to date with the appropriate technology and knowledge. The eye care practitioners listed on our platform are actively involved in the development of the field and must qualify through training to be listed. Have your child spend more time outdoors. The latest evidence indicates that higher level of natural light are beneficial. …to protect your child’s future vision and ocular health! This generation of children are spending less time outdoors. There is strong evidence that spending more time outside in natural daylight will delay the onset of myopia and reduce the final level of myopia. Studies have also shown that myopic children become more myopic in the winter months than they do in the summer. Shorter periods of natural daylight being cited as the reason. Different studies advocate spending different lengths of time outdoors. Some say as little as 40 minutes a day outside can be of benefit whilst others believe 2 hours a day to be ideal. We will report on this as the wealth of knowledge grows and evidence supports lifestyle and a potential nutritional impact on myopia. Emerging research suggests Vitamin D and Lutein might offer a protective mechanism in myopia. Time outdoors and physical activity as predictors of incident myopia in childhood: a prospective cohort study. Protective effects of high ambient lighting on the development of form-deprivation myopia in rhesus monkeys. This generation of children are spending less time outdoors. There is strong evidence that spending more time outside in natural daylight will delay the onset of myopia and reduce the final level of myopia. Studies have also shown that myopic children become more myopic in the winter months than they do in the summer. Shorter periods of natural daylight being cited as the reason. Different studies advocate spending different lengths of time outdoors. Some say as little as 40 minutes a day outside can be of benefit whilst others believe 2 hours a day to be ideal. We will report on this as the wealth of knowledge grows and evidence supports lifestyle and a potential nutritional impact on myopia. Emerging reseach suggests Vitamin D and Lutein might offer a protective mechanism in myopia. Ortho-K contact lenses are rigid contact lenses that are worn overnight and may be put on the eye and removed in the morning by parents or the child. During wear, the lenses re-shape the eye surface so that the child can see clearly without spectacles during the following day. Sometimes a top-up pair of glasses may be necessary if, for example, there is a significant amount of astigmatism in the prescription. The resulting corneal shape has been shown to slow the progression of myopia significantly as well as giving spectacle-free daytime vision. Since this method requires special skills and advanced corneal mapping (topography), the Ortho-K contact lenses not all Eye Care Practitioners are able to offer this. Myopia control with orthokeratology contact lenses in Spain: a comparison of vision-related quality-of-life measures between orthokeratology contact lenses and single-vision spectacles. There are a number of specialist soft lenses (including disposable lenses) which have an altered peripheral focus which has been shown to reduce the one mechanism that drives myopic progression. These are as comfortable to wear as normal soft lenses and are well tolerated by children as young as 6 years of age. A common myth is that children cannot wear lenses. The vast majority of children cope very well with placing the lens on the eye and removing themselves. It is imperative that these are fitted by appropriate professionals and that regular appointments be attended and hygiene routines are strictly adhered to. 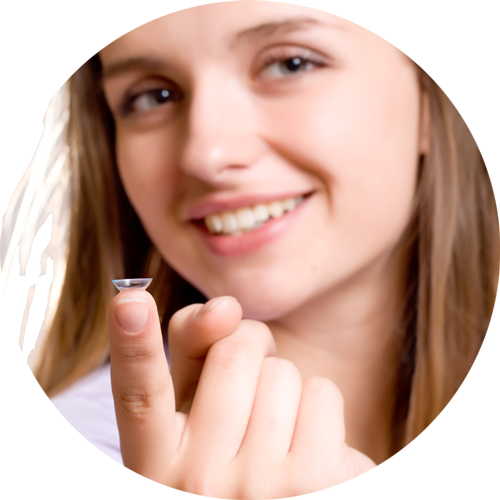 A new 1 Day contact lens special designed for Myopia Control is now available in some countries around the world. The MiSight 1 Day contact lens from CooperVision showed good results in a Three-Year Study. The effect of multifocal soft contact lenses on peripheral refraction. Efficacy Comparison of 16 Interventions for Myopia Control in Children: A Network Meta-analysis. Atropine eye drops are used by Ophthalmologists during an eye examination to determine the absolute focussing error of an eye. The drug prevents the pupil from getting smaller, therefore it remains large even in bright conditions. It also stops the eye from changing focus for itself, so that after having the drops, near objects appear blurred. In that type of clinical examination, 1% Atropine is used, but studies have shown good results for slowing myopia control with only 0.01% Atropine. This very low concentration has much less of an effect on the blurring of near vision and does not therefore cause any problems for carrying out school work. One-year multicenter, and efficacy study of 2% pirenzepine ophthalmic gel in children with myopia. Treatment of childhood myopia: changes after stopping atropine 0.01%, 0.1% and 0.5%. If contact lenses are not an option, then glasses are necessary for clear distance vision. Bifocal glasses (clear distant vision on top, reading vision on the bottom) or progressive addition lenses (PALs) may have a slight advantage for reducing myopia over ‘ordinary’ single vision distance glasses. The current literature suggests this is the least effective of all the myopia control methods. Spectacle lens manufacturers are researching specially designed myopia control lenses. Currently these are only available in some countries and evidence suggests customised spectacle lenses offer only a ‘moderate effectiveness’ in slowing myopia. advise professionals on a care plan that have an evidence based approach using the full range of accredited strategies and products. These specialist lenses are very restricted and not many clinics currently have these available. 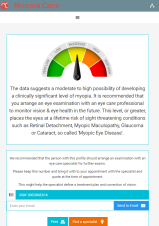 It is hoped most MyopiaCare specialists will be first to offer these as an option for use in conjunction with other treatment options, drops, contact lenses and lifestyle advice. A randomized clinical trial of progressive addition lenses versus single vision lenses on the progression of myopia in children.